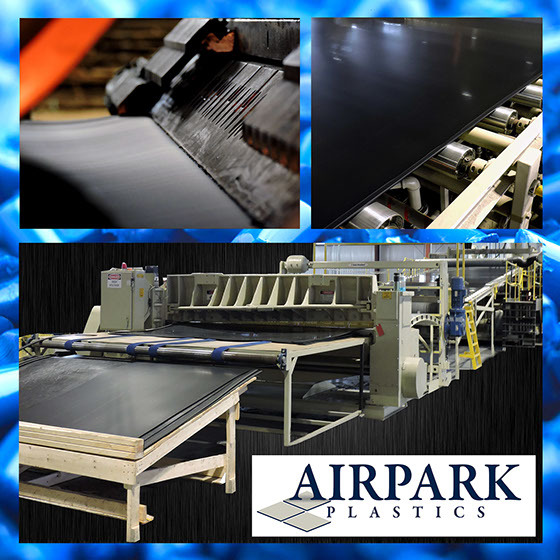 Airpark Plastics, LLC is an innovative custom thermoplastic polyolefin sheet stock manufacturer. We work with your individual specifications to provide a wide array of customizable options to meet your plastic sheet needs. In 2007 Airpark Plastics, LLC was started with a 20,000 square foot manufacturing facility that housed 1 extrusion line, a post-industrial recycling operation, and a knowledgeable work force with over 250 years of combined extrusion experience. Our initial throughput was 10,000,000 lbs. per year of plastic through that one extrusion line. Since 2007, we have expanded both our capabilities and our throughput. Today, Airpark Plastics, LLC operates 4 extrusion lines in a state of the art 36,000 square foot facility, with a vast range of capabilities. Currently, we have the ability to extrude over 44,000,000 lbs. of plastic per year. The plastic extrusion process begins with the placement of raw resin into the extruder’s blender-hopper. Additives necessary for a particular application (such as UV inhibitors or colorants), then are added to the blender- hopper to formulate the desired outcome. Once in place, the resin is typically gravity-fed through the feed throat of the hopper down into the extruder’s barrel. Within the barrel is a long, rotating screw that feeds the resin forward in the barrel towards the die. As the resin moves along within the barrel, it is subjected to extremely high temperatures until it starts to melt. Depending on the type of thermoplastic, barrel temperatures can range between 400 and 530 degrees Fahrenheit. Most extruder’s have a barrel that gradually increases in heat from the loading end to the feed pipe to enable gradual melting and minimize the possibility of plastic degradation. Once the molten plastic reaches the end of the barrel, it is forced through a screen pack and fed into the feed pipe that leads to the die. The screen, reinforced by a breaker plate due to high pressures in the barrel, serves to remove contaminants that may be present in the molten plastic. The porosity of the screen, number of screens, and other factors can be manipulated until uniform melting occurs as a result of the right amount of back pressure. Once in the feed pipe, the molten plastic is fed into the die. From the die, it is fed into cooling rolls and then is sheared to the sheet length desired. Laminates: Customizable laminates from striping (examples in email) to specialty films (examples in email). Please contact Air Park Plastics with any questions you have and discover how we can work together.